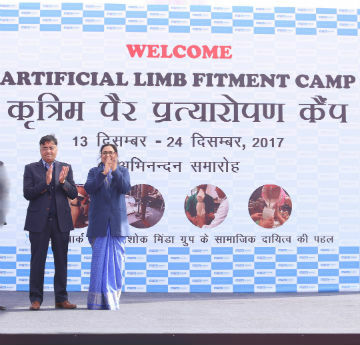 New Delhi: Spark Minda, Ashok Minda Group, continuing their societal welfare campaigns has setup an artificial limb fitment camp at its Noida (UP) facility. In continuation to its legacy of social welfare drives, the artificial limb fitment camp is aimed to heal and treat more than 1000 patients with certain disabilities during the 12 days of operation. The camp has been set up at the Noida facility of its flagship company, Minda Corporation Limited (NSE: MINDACORP, BSE: 538962), Sector 59- Noida. It has been organized in association with Bhagwan Mahaveer Viklaang Sahatya Samiti (Jaipur Foot) from 13th December to 24th December, 2017. The camp is providing end-to-end support in Limb fitment, Caliper fitment, providing Walkers, Elbow Crutches, Tricycles, Wheel chairs etc, all in same day and as per requirement of the patient. Spark Minda has been prominently holding such initiatives nationally and internationally from Noida to Indonesia in which amputees were benefitted with 1683 fitments during last couple of years. The activity is part of ‘Saksham’ – a CSR program started by Spark Minda, Ashok Minda Group to help Persons with Disabilities (PWDs). Under Saksham, the Group aims to provide accessible and assistive technologies, impart skill training through OJT (On the job training), create inclusive workplace and ergonomics, train them for 5s and life skills, employ PWD’s (Persons with Disability). The whole idea of initiating and implementing campaign is sustain the lives of PWD’s (Persons with Disability). Spark Minda, Ashok Minda Group has been involved in Community Development initiatives since decades. In continuation to the legacy of a responsible corporate citizenship, the CSR activities being taken at the group are derived from the triple bottom line model of People, Planet and Profit. Ensuring environment sustainability with community care are the thematic divisions, surrounding which the CSR activities are planned and executed across the Group. Community is always a stakeholder for both directly implemented and collaborative projects. Guided from the Millennium Development Goal and CSR under Companies Act 2013, Education; Vocational Training and Livelihood promotion; Health and Sanitation; support to differently abled; Environment Sustainability and Women Empowerment are current broader head of intervention across the Group. To implement the CSR projects, Spark Minda has established Spark Minda Foundation. Spark Minda Foundation is a company incorporated u/s 8 of the Companies Act, 2013. It is a 100% subsidiary of Minda Corporation Limited (NSE: MINDACORP, BSE: 538962), a leading automotive component & flagship company of Spark Minda, Ashok Minda Group). Most of the existing Community Development projects of the Group have been brought under the umbrella of Spark Minda Foundation. Under Spark Minda Foundation, the major community development projects are operational at Gautam Buddha Nagar of Greater Noida in U.P, Pillaipakkam district of Tamil Nadu and suburban areas of Uttarakhand and Rajgurunagar district of Maharashtra. These projects are benefitting Children, youth and women at large through its quality delivery and sustenance.